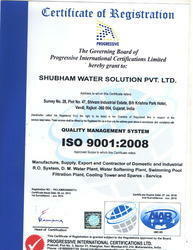 Started our operations in the year 2010, we, an ISO 9001:2008 certified Shubham Water Solution Pvt. Ltd., are considered to be one of the leading manufacturers, traders and suppliers of a wide range of the finest quality of Water Treatment Plants. Inclusive of Reverse Osmosis Plants, RO Systems and Water Chilling Plants, we offer a wide range of water treatment plants. Known for their user-friendly operation, robust design, high performance, low maintenance, reduced noise level and longer serving life, these water treatment plants are highly demanded in various commercial and industrial applications. As per the requirements provided by the customers, these water treatment plants can be customized at our end. Well-equipped with latest machinery, equipment and tools, we have been able to take and maintain bulk demands in the most efficient manner. For the purpose of ensuring that different manufacturing, in-house quality testing, warehousing, packaging and sales & marketing procedures are carried out in the most streamlined and standardized operations. we upgrade our infrastructure, to meet the diverse needs of our valuable customers in the most efficient manner. Under the supervision of our mentors, Mr. Vimal, we have been able to cater to the precise needs of our valuable customers in the most efficient manner. They hold expertise in their area of work and have helped us in attaining a commendable position in this domain, due to their excellent management skills and innovative business ideas that are coupled with customer oriented approach and ethical business polices. The quality policy of Shubham Water Solution Pvt. Ltd. is founded on a commitment by all Employees to provide products and service that satisfy our customers. Our team of professionals works round the clock to offer our clients far reaching experience. Team-work plays a crucial role in determining success and growth of any organization. Keeping in mind this fact, our professionals work in close synchronization with each other to produce world class products. Regular training programs have been organized by our firm so as to keep our professionals abreast with the latest market trends. With the help of our skilled professionals, we can handle bulk orders of the clients in an efficient manner. Our firm is backed with modern infrastructure unit which is well armed with high-end machines and technology. This unit is alienated into various departments and works in close coordination with each to produce world class products. Each department is manned and follows defined industry norms to meet the set industry standards. The installed machines used in production process are checked on regular basis and are upgraded as latest technological advancements. With the help of our modern infrastructure, we are able to furnish bulk and urgent orders of our clients within predefined time frame. We are known as an eminent manufacturer and supplier of high quality Demineralization Plant, Water Softening Plant, Reverse Osmosis Plant, R.O. System, Water Chilling Plant, Mineral Water Plant, Swimming Pool Product and many more.